The day after the presidential election, in an interview posted on the National Rifle Association website, NRA President David Keene attributed Mitt Romney’s loss to the Democratic turnout machine. “I thought we were going to win that race,” he said. But he added later that the right-to-bear-arms movement had lost “a battle, a very important battle, but we’re not going to lose this war. “(Barack Obama) and his administration are going to do everything they can to gut the Second Amendment, and we’ve got to fight them step by step by step,” he said. Monday night, Keene addressed a crowd of a couple hundred gathered at the Crown Room at the Naniloa Volcanoes Resort on how this war over Second Amendment rights will unfold. The speech was sponsored by the Conservative Forum For Hawaii, and it drew a mix of staunch conservatives, hunters and one elected official, Prosecutor-elect Mitch Roth. They listened to Keene describe how Obama, no longer restrained by politics, would work to restrict the individual’s constitutional right to bear arms, either through the Arms Trade Treaty or by appointing judges who would overturn a 2008 Supreme Court decision recognizing that right. “There has been from the beginning of the culture wars in the 1970s, a group that has felt that the Second Amendment symbolizes something they don’t like about the America we inherited from our forebears,” Keene said. Keene, a native of Wisconsin, has a long history of involvement in presidential politics, dating to his time as special assistant to Vice President Spiro Agnew in the Nixon administration. 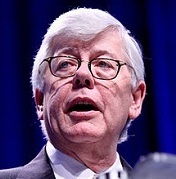 From 1984 to 2011, he served as chairman of the American Conservative Union; he was first elected to the NRA Board of Directors in 2000 and rose to become its first vice president in 2011. In May 2011, he was elected president of the NRA and its 4.3 million members, becoming head of one of Washington’s most powerful lobbying organization. No constitutional right is absolute, Keene acknowledged, and that includes the right to bear arms. He agreed that firearms should not be in the hands of felons, children, drug dealers or those with certain mental disorders. But he said every jurisdiction in the nation will need to reassess its laws to see how they comply with the Supreme Court’s rulings recognizing the right. In the last campaign, Keene said, he had traveled the country, warning people that the Obama campaign was moving to strip Americans of their Second Amendment rights. He cited a Reuters news article that stated the United States backed a U.N. committee’s call to restart negotiations on an international treaty to regulate the global arms trade, hours after Obama’s re-election was assured. “That tells us what we’re facing,” Keene said, predicting that Obama will lose the coming fight. It was a long day for Keene and his wife, who had engagements in Kona earlier in the day; after the remarks he returned to West Hawaii and flew to Oahu for more events there. He also answered questions from the audience. One woman asked how exactly Obama would take away gun rights. Keene replied that the president could reinstate the lapsed Clinton-era assault weapons ban, which was unlikely; he could appoint anti-gun rights judges, or he could go through the United Nations for the arms trade treaty. Keene’s remarks were preceded by a short but fiery speech by Forum President Walter Moe, who said that even though his side lost the election, he was still angry and promised to keep on fighting. Email Peter Sur at [email protected].